Hi everyone, Micki here with a bright, colorful art journal page created by playing with Wendy Vecchi’s FABULOUS (love-love-love) Translucent Embossing Paste and Dylusions new stencils. In typical “Micki” fashion, I just grabbed my Dylusions Spray Inks, Distress Paints and went for it! Opened my art journal to “one of those” pages that desperately needed a re-do. Covered the pages with a very light layer of white gesso using a brayer to apply it. Followed by having lots and lots of fun with the ink sprays. As you can see in the pictures above, I just had fun, spritzing inks, dabbing paint. I think I also brayed on some paint in between the spraying of inks. Next I dabbed Chipped Shappire Distress Paint around the edge of the pages which were then blended using a baby wipe. And then I played with Wendy’s Translucent Embossing Paste and Brick Wall stencil. I applied the embossing paste through the Brick Wall stencil first horizontally, then (once dry) turning the stencil to apply another layer of embossing paste with the bricks vertical. The first picture is with the embossing paste still wet. Here it is with the Translucent Embossing paste dry. OMGosh, I love – love – love how the colors show through the paste. I can not believe I waited to get this “awesome” stuff!! I also grabbed Wendy’s Black Embossing Paste and her Artful Thoughts stencil. I used some strips of Eclipse masking tape to cover all the words except “THOUGHTS”. 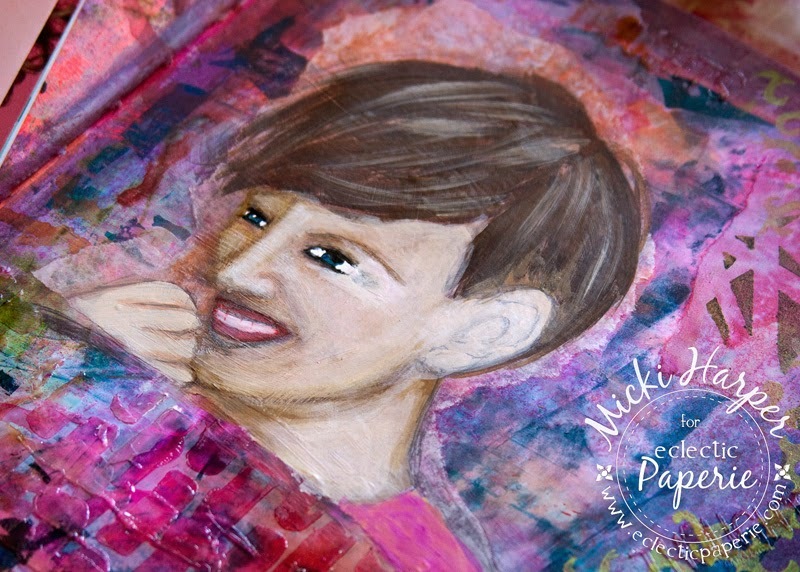 I added Translucent Embossing paste randomly around the pages followed with the Black Embossing paste towards the center of the two page spread (I knew I would sketch/paint a face on the opposite page). When I got to this point, I knew that the one eye was too large, so I covered it up but because I used a black marker around the eyes, I couldn’t get it to completely disappear. Tissue paper pieces to the rescue. Actually this is a piece of Bleeding Tissue paper – a trick I learned in my class with Mindy Lacefield last week. That worked great and I was able to finish the face, using mixed paint and Faber-Castell Markers which were blended either with my finger or with a clean damp brush. These markers are my go to tool to help blend the paint and just make a face look more like a face. I don’t know how to explain it, they are just great. Oh if I thought painting a nose or eyes were hard, ha – I was in for a treat doing the teeth. So very hard!!!! And there you have it, as a final step I added some more texture using stenciling and a recycled plastic cap. I also added another layer of “bricks” using some yellow paint right over the translucent bricks. The depth that creates is awesome!!! The sentiment is from Dylusions Quintessential Quotes set, stamped onto tissue paper, cut apart and glued down. I used a black ball point pen to go over the lettering so that it is more visible. Then added a bit of outlining with the white Faber-Castell Big Brush marker. Not too bad, don’t you think? My lesson from this? Just Do It and you’ll be amazed what you’ll create. AND get some of that AWESOME Wendy Vecchi Studio 490 Embossing Paste!!!!! As always, I hope you were inspired to get inky and have fun! staggeringly beautiful, from start to finish! Hey its good that how simple it to communicate with people and have them understand a certain topic, I am so happy that visit this site. Thank for your good post. OMG....to be this free in creating!! You go GF! AWESOME and GORGEOUS, Micki! LOVE your BG and the translucent paste! And your girl is so FAB! LOVE her eyes and her hair! Swooooooonworthy Micki . . . I love, love your Art ! !